To swing a pendulum, picked out from a number of them at random, without touching it is a very puzzling trick. The articles necessary are a medium-sized table and a number of pendulums, some of which are suspended from a rod with their lower weighted ends inside of water and wine glasses placed on the table, and others attached to corks so that they will hang-inside of bottles. The spectators gather around the table which can be in full light. The performer sits at one side of the table with his hands flat on the top. 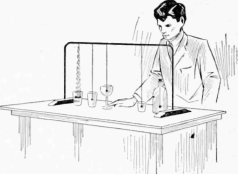 A person may pick out any pendulum and ask him to swing it, which he will proceed to do without touching it, also making it strike the glass while it swings. Another pendulum may be pointed out and he will start that one apparently by looking at it, while the other one stops. This may seem to be impossible, yet it is very easy. It will be seen that no two pendulums have the same length. A pendulum makes a certain number of swings in a given time, depending on its length. A long pendulum requires more time to complete its swing and will, therefore, make a less number of swings than a short one in the same time. It is only necessary to move the table slightly and watch the pendulum picked out until it be- gins to swing independently of the others, which soon happens. To make the longer pendulums swing, longer movements of the table top must be made. With a little practice anyone can become a skilled medium in pendulum swinging. - Contributed by James A. Hart, Philadelphia, Pa.